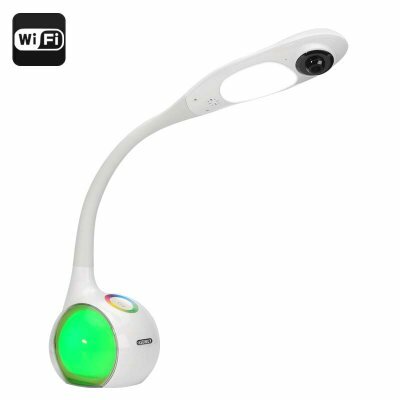 Successfully Added Asdibuy Baby Monitor + Lamp - 720P Camera, P2P, Wi-Fi, Two-way Audio, Color Changing Base to your Shopping Cart. This fun two-in-one gadget will help you keep an eye on what matters most with a 720P camera, remote access and live transmission. It’s always great having gadgets that do more than one thing, and with the Asdibuy Baby Monitor you have a device that comes with quite a few practical functions. At first glance, it’s a standard table lamp - but don’t be fooled by modest looks. The gadget doubles as a baby monitor packing a 720P camera, Wi-Fi streaming. With the Asdibuy Baby Monitor, you are sure to always be in the know. Whether checking on your child before bedtime or saying hi from an out-of-town business trip, the baby monitor is a great way to ensure safety and comfort for your child. The monitor comes with a lamp - and thus fits perfectly in your child’s bedroom environment, working great as a desk light or a nightstand lamp. The lamp comes with adjustable white and color light, so that you can always find the right balance for any time of day. The lamp comes with a flexible stand so you can easily find the best angle for the built in camera. Another great feature is the color changing base, that can add a spark of excitement to any interior and be a fun toy for your child to play with. The baby monitor comes equipped with a 720P camera and gives you a clear high-quality image at any time. With Wi-Fi a network, you will also have remote access to the footage - no matter where you are. Thanks to the built-in speaker and mic, you will be able to not only see, but also interact with your child remotely. The Asdibuy Baby Monitor comes with a 12 months warranty. Brought to you by the leader in electronic devices as well as wholesale baby monitors.